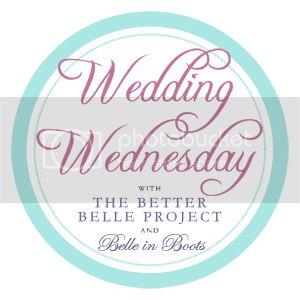 I stared blogging about our wedding, mostly for me, over a month ago. I thought it was time to do so again so I could remember the most important part of any wedding day - the ceremony! Now, I'm going to talk about something that not a lot of people love: writing your own ceremony and vows. Neither Andrew nor I grew up going to a specific church. We didn't have a pastor who we wanted to marry us, so we had to find someone on our own. And as for vows, I didn't want to be his lawfully wedded wife. I wanted a wedding as a whole and especially a ceremony that was uniquely us, and what better way to be "us" than to create everything on my own? 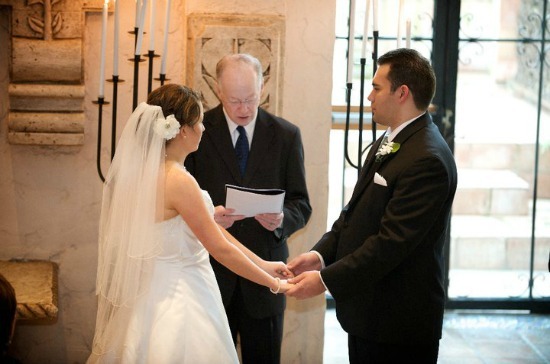 I went to the internet to find an officiant and ended up using weddingpastor.com. (In researching to write this post, I learned that the lovely man who married us has since passed away. He told me that our ceremony was one of the most memorable he had ever performed and sent us a note wishing us well after the wedding. So sad!). There are many bios online and you can choose an officiant who is a good fit for you, but we weren't picky. I made it clear from the beginning that I intended on creating something on my own, so I just needed someone who was okay with straying from the norm. We met our officiant one evening at a restaurant so we could get to know each other and mostly corresponded via email. It was a perfect set-up. A Call to Celebration: Something saying our names and welcoming our guests. Address: It acknowledged the step we were about to take and the importance of marriage. I wanted a reading in here that showed that. It also included a prayer. Consecration: Literally means "to associate with the sacred. "I wanted it to define what our marriage was going to be. Declaration of Intent: This was a general statement about what we were going to do followed by the vows we had written. It basically said "We're DOING this!" Vow and Ring Exchange: I kept this in there because we had to exchange rings but it wasn't my favorite part. I kept these vows simple. Symbolic Thing: This is where you do a unity candle, sand ceremony, etc. Some people omit that entirely. We chose a wine and love letter box, described in the ceremony text, and followed it with another reading. Pronouncement: I fell in love with this part and I wish I could credit it to whoever wrote it. It's a longer way of saying that we were officially married. Since it is kind of long, I have linked to our wedding ceremony text as a Google Doc. The officiant changed it very little and a few of my notes are still in there. You can find it here. 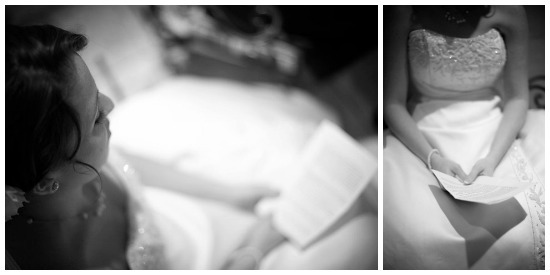 I took time alone before the ceremony to try to remember my vows... it didn't work. I ended up reading them! Writing vows was in a way, harder. In my head, they had to be a perfect declaration of my love and that was a lot of pressure! I came up with a basic formula so that Andrew and I both had a place to start and our vows would somewhat mirror one another. I insisted We chose not to show one another our vows and let them be a surprise on our wedding day. Needless to say, his made me into a complete, blubbering mess. Andrew, you know better than anyone how stubborn I am. Whenever I get an idea in my head for something I have to have, you always say that we are going to go look for a unicorn. You think I get ideas for things in my head that don't really exist. You know that I won't rest until I find exactly what I'm looking for. You think that these things that I want, like mid-calf black suede ankle boots with buckles or the color of teal we chose for this wedding, will be impossible to find. But usually, I am right. I search any place I can think of until I find what I am looking for, or find my unicorn, as you put it. Ever since I was little, I knew I wanted to get married. I wanted someone who would be there for me through everything, someone to be my best friend, a person I could laugh with at the end of every day. I didn't know what I wanted this man to look like, or when I would meet him, but I knew I would find him one day. Like most of the things I go in search of, I only had a vague idea of what I wanted. Mostly, I always know that I have found what I was looking for when I see it. When you came along, you were it. You are the person I have been looking for and the person I want standing next to me for the rest of my life. You are my unicorn. I love you all the time, even when you annoy me past the point of frustration. I love the way you look at me when you know I am frustrated and I can't help but laugh at how silly we both are. I love the way you can make me laugh and the way you always tell it like it is. I love the little things you do for me, like warming up the plates at dinner before putting food on them or driving me to get frozen custard in a torrential downpour. These things may sound trivial, but to me it shows how much my comfort and happiness mean to you. I love the home we already share with all of our inside jokes, song parodies, and television obsessions. I love that you are probably the only man in America who has watched all seven seasons of Gilmore Girls, just because I told you it was a good show. I promise to love you like Penny loved Desmond, like Amy loved Ephraim, and of course, like Pam loves Jim. Only I promise that our love will be more enduring than the shows all of these TV characters are on. I want to continue to fill our home with more memories. I want us to grow together and have fun together and go through all of life's challenges together. I may not be the perfect wife. Cooking and cleaning are definitely not my strong suits. But, in the ways that matter, I promise to be the best wife I can be. I will love you, even when it gets difficult. I will be strong when you can't. I promise to always be on your side. I will be your partner. I want you to be beside me for the rest of our lives. I love that even your faults come from your desire to be good. Even when tripping over a cardboard box on our dining room floor drives me crazy, I know it's because you want to recycle that box so that it doesn't end up in a landfill and, once my toe stops throbbing from stubbing itself on the aforementioned box, I admire the desire you have to treat everything that way. I love that it takes you two weeks and 12 stores to find someone's birthday present. It's not because you're indecisive. Well, maybe a little, but it's because you want to make sure that person has a present they're going to love. The decision to ask you to marry me was the easiest decision I've ever made. For me, it was never really a choice. I could never imagine you not being by my side. I love that you can make me laugh at anything that happens in life. We spend more time laughing than any two people I've ever known. I think that's a pretty good way to live. I love that we both get excited over the smallest things like fixing a sink, and how we race each other to the front door to get a package from UPS, and how you make me close my eyes and act like a kid on Christmas because you brought me home a cookie. I love how we can communicate with each other using nothing but quotes from The Office. That's a rare skill I once thought only my sister and I possessed. I promise to continue to be the person you fell in love with and continue to appreciate the person you are. I promise to work with you towards filling our home with the same laughter and love that has gotten us to this point. I promise to do my best to keep that smile on your face, and to stay strong for you in the moments when it seems impossible to smile. So, there it is! It was totally worth it in my opinion and if you aren't a fan of traditional language, I completely recommend writing your own ceremony or vows! If you're still reading this, you must really like weddings. 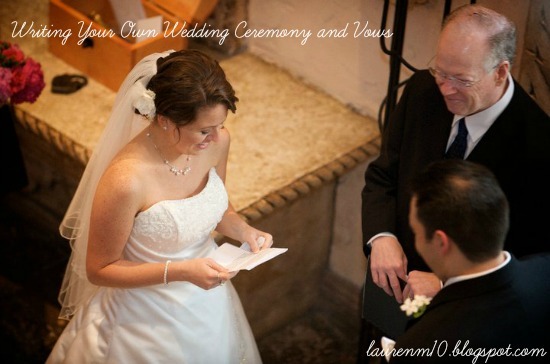 Did you or do you plan to write your own vows? Can you believe we both referenced The Office? Clearly we are meant to be! This is perfect! We are writing our own ceremony and vows as well. And I think I know which weddingbee.com person you are talking about. I have their website saved on my other computer at home. We bought the book that that girl mentioned and have been slowly working through what we like, what we don't. I haven't even thought of the vows part yet. EEK! "I promise to love you like Penny loved Desmond, like Amy loved Ephraim, and of course, like Pam loves Jim. " Oh my goodness, you are so awesome. I love that you both referenced the office in your vows. Your vows are so, so sweet. Aww! I love all the little inside moments y'all shared with each other. 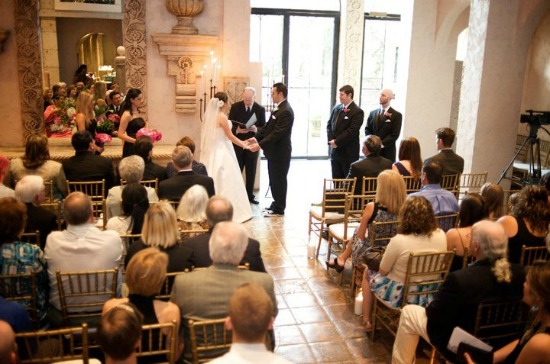 These vows are so sweet! I love that your ceremony was so personal! We aren't that far in the planning process (though I should probably start thinking about it) so I will definitely be coming back to this post for inspiration! Thank you! love this! glad you put your own spin on what it means to you. i think the words are outdated anyway! Love this post! Y'alls vows brought tears to my eyes. Thanks for sharing such a special moment! I love the idea of writing our own vows. That's what we did too. Beautiful vows!! I love them! We wrote our ceremony too. And while we didn't write our actual vows, did use ones that weren't very traditional. And I was obsessed with weddingbee while planning too, and for a while really wanted to be a bee. I'm guessing you're probabaly thinking of Mrs. Cherry Pie's posts? There are a lot of bess that wrote their own ceremony, but hers is the one most people seem to refer back to. I am bawling. You two are precious. I can't get over you promising to love him like Pam loves Jim. That's my favorite. And you two communicating with quotes from The Office pretty much makes you my favorite couple ever.